Download the latest Pipeline releases, and stay up to date on new capabilities. System Pipeline 2012 is a complex system of automated design of steel and polyethylene main pipelines and pipe networks of gas distribution and consumption. System Pipeline 2012 is based on AutoCAD. The use of System Pipeline 2012 in the design works allows to increase manyfold the performance of the design team and to issue the design documentation of high quality to the customer in the shortest possible time. For instance, one user is able to prepare design material for a gas pipeline of up to 3 kilometers of length in one working day. System Pipeline 2012 fundamentally changes the style of designing pipelines. Man hours for drawing up electronic versions of documents are decreased by 90%. All the technical operations are focused on the creation of a unified information model of the designed pipeline kept in the data base and accessible simultaneously to all the participants of the project. All the design drawings and lists are generated automatically on the basis of the information from the data base which ensures the integrity and consistency of the whole design project. All the drawings are kept in DWG format which is a standard one for designers and builders. 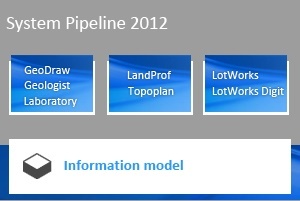 System Pipeline 2012 consists of the following seven applications which can be used both separately and jointly: applications for preparation of topographic plans and designing of pipelines in the plan (LandProf 2012, TopoPlan 2012), for vertical planning of pipelines in the profile (LotWorks 2012), for processing of engineering geological survey materials (GeoDraw 2012, Geologist 4, Laboratory 4). Jointly, all the applications cover the activities of all the subdivisions of a civil engineering company. An important advantage is that the system can be incorporated in the existing information technology that is the designing organization or subcontractors can process the results of geodesic surveys and prepare initial topographic plans which will be used to design the object in any systems (CREDO, AutoCADCivil 3D, etc.). Therefore, the incorporation process is smooth and requires no additional expenses for modernization of the existing information technology. Focusing the production processes on the creation of a unified information model of the designed pipeline is a key step in the development of the design information infrastructure which guarantees high quality and performance. All the applications of System Pipeline 2012 can be downloaded from web site. An accompanying video presents all the stages of a pipeline design development using a real example.